Ocean Waves Motel is located at 74 Marine Pde, Mt Maunganui. Being across the road from the beach gives you the opportunity to take in the view from your unit. 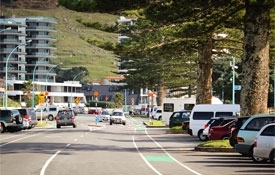 Stroll across the road to the water.A 10-minute walk will have you on the Main Ocean Beach, or at the commencement of the walking track around the base of Mount Maunganui (Mauao).If shopping is what you are looking for a 5-minute walk will have you in the CBD.The Main Beach provides you with swimming and surfing opportunities whilst Pilot Bay offers flat water. The hot pools are also here. There are many commercial operators providing opportunities to enjoy the water. 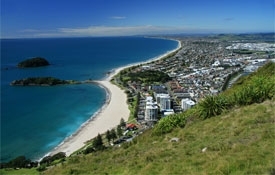 These include – fishing charters, dolphin watching, game fishing, diving and snorkelling, surfing lessons, surf board hire, jet skiing, kayaking or just lying on the beach.A “must-do” is to walk around the base of Mount Maunganui whilst a climb to the summit will provide spectacular views. 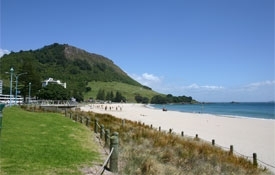 Mt Maunganui Beach is one of New Zealand's most pristine beaches. With a walker-friendly boardwalk and safe swimming area the Mount Maunganui Beach is a must for anyone travelling the North Island. Because of the formation of the land and ocean floor Mount Maunganui beach is lucky to have both a harbour beach and an ocean beach. The harbour beach makes for safe swimming and the ocean beach provides some of the best surf breaks around. 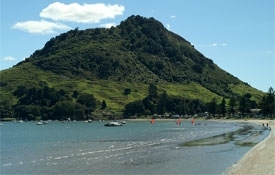 Did you know that Mount Maunganui is named after the extinct volcanic cone at the end of the beach, its Maori name is "Mauao". Everyone loves something to do that is FREE! Mount Maunganui's Summit walk is ranked #1 on TripAdvisor. A few minutes drive from Ocean Waves Motel gets you to the foot of the Mount for a challenging but worthwhile uphill walk. Beautiful views of the Mount and the sea. The Mount Summit walk takes about 1 hour and 20 minutes. A good quality safe track. Mount Manganui Hot Water Salt Pools is in the TripAdvisors Top 10 activities to do while in the Bay of Plenty. Whether needing to heal some old wounds or just relax then the pools are a must do while visiting Mount Maunganui. The pools are open 7 days and a short 5 minute drive from Ocean Waves Motel. 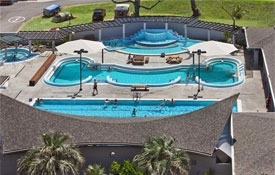 There are two outdoor pools, a couple of spa's and a toddlers pool for the small ones. Downtown the Mount is a bustling beachside town with a village feel. Walk the paved Main Street with boutique shops, funky fashions or take a break in a trendy café for a flat white and gourmet muffin. Main Street the Mount has a vibrant night life as well with a fresh live music scene. Plenty of bars and restaurants open till the wee hours that are always packed in the crazy summer season. 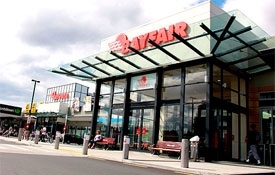 Bayfair Shopping Mall is the Bay of Plenty's shopping mecca. Open all hours, 7 days a week for budget shoppers looking for a bargain or label-hunters looking for the latest fashion. Bayfair Shopping Mall is within walking distance to Ocean Waves Motel or a short drive. There is an eating hall at Bayfair, cafés, restaurants, a movie theatre and a supermarket. 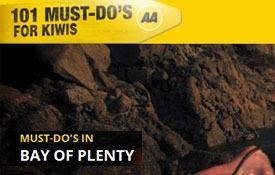 101 Must-Do's for Kiwis is back with a special list for a Kiwi summer. Mount Maunganui and Tauranga has so much to see and do so check out the must-do things from the 101 Must Do's. From events and festivals to activities and new attractions, classic holiday spots and hidden gems, you'll find loads of ideas to inspire your visit to Mount Maunganui.